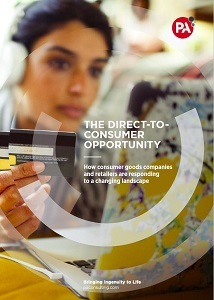 Fundamental changes in consumer buying behaviours and disruptive technologies are interacting to transform consumer goods and retail markets globally. Companies are formulating a diverse and complex suite of ways to engage consumers, with many focusing on digitally enabled platform business models. While change, uncertainty and challenges define the landscape, it’s also rich in opportunity for far-sighted companies that can navigate these complexities and create effective consumer engagement strategies. Our report creates a global picture of this complex new world. In May 2018 we surveyed senior leaders from 150 consumer goods companies and 150 retailers for their perspectives on online marketplaces and direct-to-consumer initiatives. We collated responses from businesses headquartered in the US, Europe and Asia-Pacific, with 100 respondents from each of the three regions. with a quarter expecting them to add more than 20 per cent to their sales by 2020. At the same time, 73 per cent of retailers expect to see a positive impact from the rise of online marketplaces in the next five years. This report presents our research findings, together with our insights and recommendations.